Comment: I assume glitch pop as a genre comes partly out of the tracker/chiptune/bitpop scene. I have always loved chiptune music even though I did not it consciously or being aware of the genre which started sometime in the 80s. Because the first playing consoles of mine were yellow cartridge-based, mostly Chinese productions. Milk & Nuts, Mutant Ninja Turtles, Lode Runner, Getaway, Konami NHL 1988, Tank, The Wild Gunman etc were the games I had spent very many hours within. I can vividly remember for a game called Bomberman which sounded as if an outtake from one of the songs by Throbbing Gristle. The rhythmic 8-bit lines within it would break to many sonic shards yet it would incessantly be trudging over the game scene. For sure, the genre was not the very first electronic music created ever (as we know very well thanks to the Sub Rosa`s compilations of noise and electronic music the first electronic and noise compositions were already peoduced in the second part of the 19th century). It was not the very first computer music ever created as well. However, I like the consistency and strength of people who follow the genre by promoting and creating by themselves. 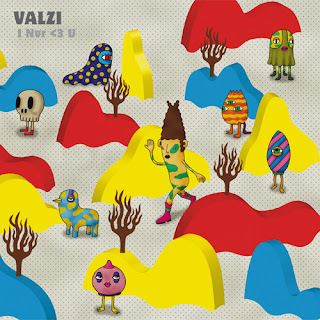 Valzi`s 11-track issue being released on Petite & Jolie is a great issue crossing at an interface of chiptune and indie electronic music. Its poppy yet elegantly exaggerated tendencies to come to the surface permanently used to provide it even a more cutting-edge shape. That's cool. It is a sort of electro pop but it chimes as if coming from a broken, abandoned computer world. Unfortunately it somehow resonates with sad news from the recent world where even celebrities do commit suicide. The soul of a broken human being can be compared with the one of a broken computer. The biggest problem in the nowadays world is that a human being is exercised to be machines but the soul within the creature is still not be ready to step to the next, robot level. The only way is to set robots free but the biggest consequence of it may be the man-machines will eradicate the human being as a species. Given that it is an example of chiptune music you should not take the adjective “exaggerated” seriously because within the genre there cannot be any of the elements exaggerated in the strict sense of the word. All is finely integrated and exposed to the ears of a hungry music fan. And the cover print is really cool by creating a psychedelic pathway to arrive at your positive self. Take it, remember it.